Lila Wheelock was born in 1890 and spent her life in New York and Connecticut. She studied at the Pennsylvania Academy of Design, and was a member of the National Association of Woman Artists. Her work was exhibited in the National Academy of Design, the Whitney Museum of American Art, and the PA Academy of Fine Arts. 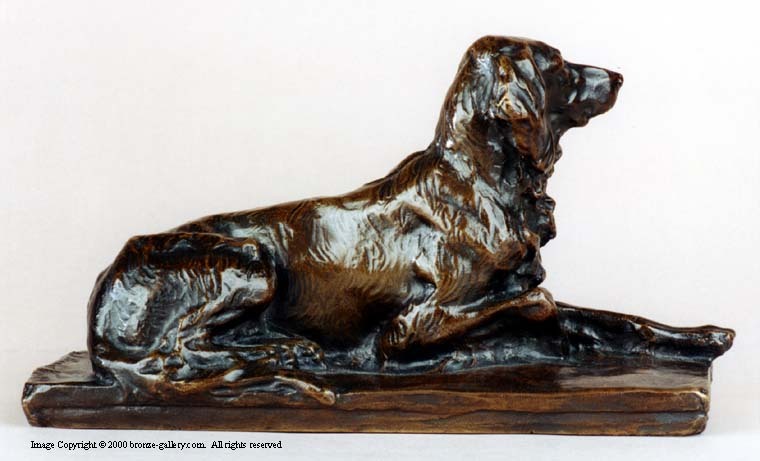 Her small sculptures of animals were quite popular yet she is not well known today. 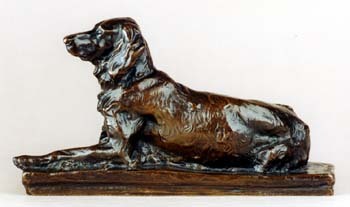 Lila did several small models of dogs and this one is a fine portrait of a Setter dog reclining. Unlike her Borzoi, this dog is alert with his head up, perhaps looking for his master. A fine bronze done in 1909, it is marked as cast #2 of a small edition with probably no more than 4 cast. A rare example of her work.